Fresh green garlic gives this dal a deep delicious flavor and makes it very healthy. Try it to savor the flavors. • Wash the dal and soak in water for around 30 minutes. • Drain the dal, add turmeric and 3 cups water and pressure cook on medium heat (3 to 4 whistles). • Once the dal is cooled, whisk to blend, and keep aside. • Heat oil in a nonstick pan/kadai, splutter jeera, and add dry chilies, ginger-green chili paste, hing, and green garlic. • Sauté for 2 minutes. • Add the chopped tomatoes and sauté till the oil separates from the mixture. • Add the cooked dal, ½ cup of water, and simmer for another 5 minutes. • Garnish with fresh coriander and serve hot. 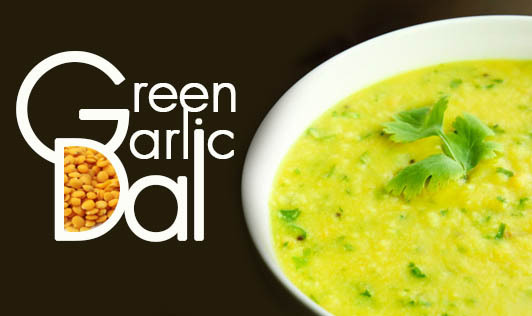 • When green garlic is not in season, replace it with a mixture of fresh coriander and garlic.